A visit to Beijing can involve a large investment. These tips will demonstrate how to visit on a budget. As with most major cities, Beijing offers plenty of easy ways to pay big money for things that won't really enhance your experience. Many North Americans don't realize that Beijing winters can be quite cold and snowy. If you go in winter, be prepared for the chill and air pollution associated with keeping buildings warm. Summers tend to be muggy and smoggy. Autumn is probably the most comfortable season for a visit (especially if you have respiratory problems), followed by spring. Restaurant food tends to be relatively inexpensive here, so you can afford to splurge a bit. For years, restaurants tended to be rather bland and lacking in creativity. But China's more moderate privatization policies in recent years have resulted in a bright new selection of eateries. If you decide not to eat in a restaurant, be sure you stick with hot meals and well-cooked entrees. Avoid raw vegetables and water that isn't bottled. In fact, if you buy bottled water from a street vendor, be certain the seal is unbroken. Some have made an industry of retrieving discarded water bottles from trash cans, refilling them from a tap and reselling them. Beijing added hotel beds to accommodate the rush of visitors the city expected for the Olympic Games. This works to a budget traveler's advantage because Beijing needed more mid-priced hotel rooms (what city doesn't?) to offset the low-cost guest houses and the opulent grand hotels. A Beijing search on Airbnb.com will show you plenty of places to stay for $50/night or less. Hostels.com shows several properties in the city, at prices ranging from $8-$59 USD/night. Mass transportation can be challenging in Beijing, but budget travelers often find it's worth the effort to learn about the Beijing subway system and avoid taxi drivers in Beijing, who have a somewhat deserved reputation for taking advantage of tourists. Subway fares are based on a zone system similar to London. Although it has been around since 1969, much of the system is new, and the government has ambitious expansion plans for the next few years. If your trip involves times and destinations that make a cab more practical, be assured you'll also find many drivers who are friendly and honest with fares. It pays to have someone write down your destination in Chinese characters on the back of your hotel's business card. At day's end, use the front of the card to help another cab driver get you back to home base. Badaling Pass is about 55 miles from Beijing and is therefore the most convenient place to view The Great Wall. Badaling is a bit touristy, but it's easy to ignore that fact when you're confronted with one of the world's most incredible sights. Badaling has a cable car that will save you the walk to the top of the wall. There is a fee for the ride, but it's a great time saver, and the spectacular views as you rise will inspire photographers of all skill levels. If the prospect of Badaling crowds is unappealing, consider visiting the wall's Mutianyu section, which is also relatively close to the city. There is a modest entry fee here, but even budget travelers will quickly forget what they paid for the privilege of seeing this walled wonder. It's also known as the Palace Museum or Imperial Palace. Emperors and their families lived here for centuries shrouded in mystery and 33-foot walls. Commoners were not admitted here for 500 years, and even now, no one is admitted to the half-mile maze of passages after 4:30 p.m. 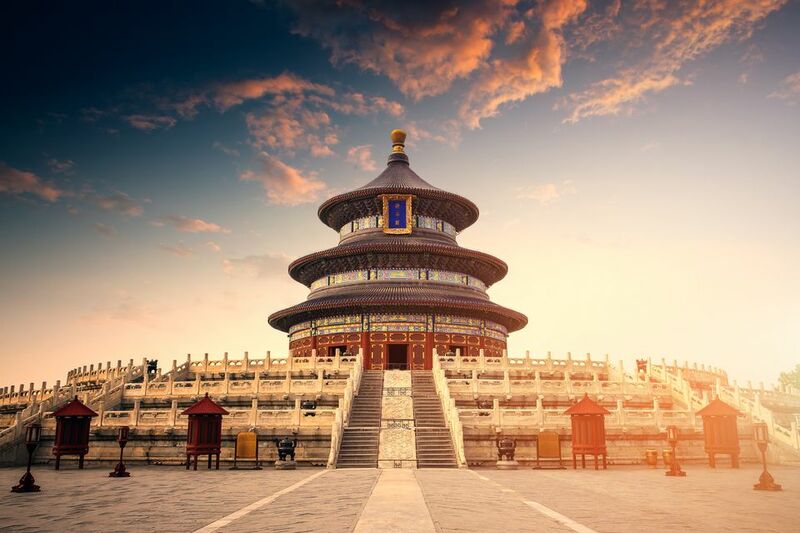 They close promptly at 5:00 p.m. North to south, try not to miss the Imperial Garden, the Hall of Heavenly Purity and the Hall of Supreme Harmony. Each is situated directly on the sightseers' route. This square-mile of pavement is one of Asia's best-known public parks. In fact, it might be one of China's greatest free attractions. Children fly beautiful, elaborate kites and enjoy ice cream treats. Some will approach westerners with unbridled enthusiasm to practice the English skills they've learned in school. It's hard to imagine this is the same place where pro-democracy protests were crushed in 1989 as the world watched in horror. Much of the killing took place away from the square, but this was the rallying point for protesters, and the government's determination to rid the area of dissenters led to the bloody crackdown. It's one of the few places on earth where feelings of joy and regret can overcome you almost simultaneously. Nonetheless, it is definitely worth a visit. Don't be in a hurry. Beijing is a city of 13 million people. Roads are crowded with cars, trucks, and bicycles. Allow plenty of time to arrive at appointments or the airport terminal. Be careful with pedicab operators near Tiananmen Square. They'll sometimes lure you onto their foot-powered cabs (also called rickshaws) with reasonable prices, then try to take you --both literally and figuratively -- for a ride. Sometimes the effort to increase the fare is modest and charming. Other times it's a ridiculous scam. Use your best judgment, and skip the ride altogether if this causes you concern. Only one day? Here's a plan: It's possible (but not recommended) to see the Great Wall at Badaling, the Forbidden City and Tiananmen Square in one long day. Simply have someone write "Great Wall Badaling, cable car entrance" and "Forbidden City, Shenwu Gate" in Chinese characters on your hotel business card. Have that same hotel helper negotiate a day-rate with a cab driver. Most drivers are happy to have one guaranteed fare for the day. By western standards, these rates are frequently quite reasonable. The driver will wait for you at the Great Wall (it's customary to pay half the fare so the driver can buy lunch while you're away). Back in Beijing at Shenwu Gate, you leave the cab at the northern entrance to the Forbidden City. Touring from north to south brings you out not too far from the famous Chairman Mao portrait, then to the edge of Tiananmen Square. Check out a proposed three-day itinerary and enjoy! If you have about 72 hours in Beijing, consider booking a few guided tours. Even independent travelers can benefit from this experience.